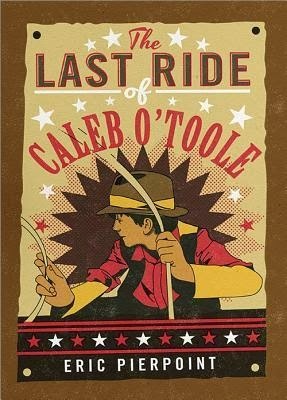 "One Night with the Laird"
Giveaway and Review: "The Last Ride of Caleb O'Toole"
"The Last Ride of Caleb O'Toole"
Caleb O'Toole could hear his mother's last words as clearly as if she was sitting right next to him. He promised her he'd keep his sisters safe. But safety is over a thousand miles away in the rugged Bitteroot Mountains--past dust-choked deserts and thorny tumbleweeds and as sun so hot, it's hard to breathe. Tornadoes and hungry wolves wait for them on the path ahead. But with the infamous Blackstone Gang hot on their trail, Caleb has no choice but to keep going. There's no telling how far the gang will go to keep their latest murder a secret. And Caleb is the number one witness to their crime. There is never a dull moment Caleb O'Toole's western adventures. He and his sisters are on their own after their parents lose their battle with Cholera. They do get some guidance from the misunderstood and infamous Henderson, while being chased by murderers, disease, and the wilderness of the old west. The adventures are one right after another, they never have a second to breathe or relax! This makes for some very exciting reading. I liked that Caleb was so smart and he was able to get out of many predicaments using his brains. He kept a very level head when the heat was on. The only drawback for me was that there was a lot of gun use. I do realize that this was the old west, and that was a way of life, but I'm still unsure about it being so prevalent in a kid's book. I'm not sure I would feel comfortable recommending this one, without a warning first. Bottom Line: A fast-paced, mile-a-minute western adventure with a smart hero. 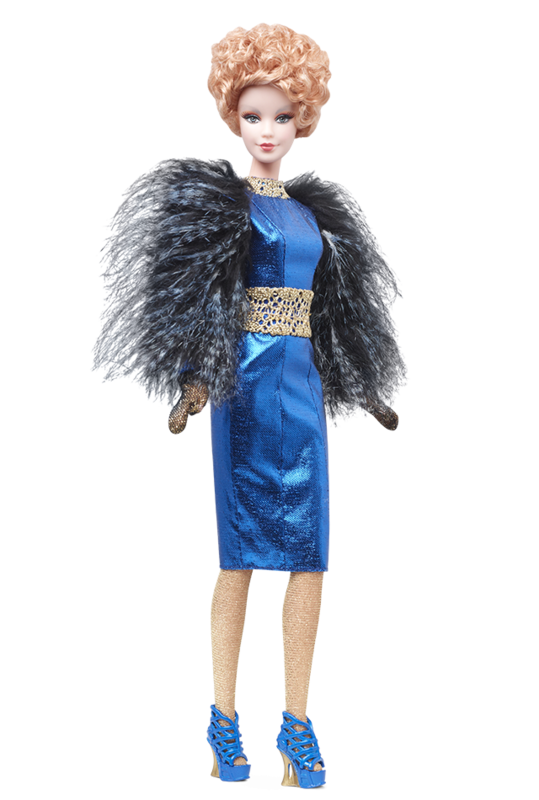 The Hunger Games: Catching Fire Barbie dolls are available for pre-order! I have the original Katniss doll, and I love her. 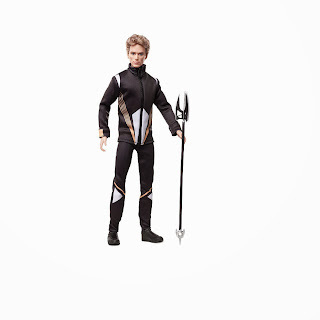 I've been waiting for the images of the Catching Fire dolls to become available, and finally http://www.barbiecollector.com has them available for pre-order. How do you think the dolls look? 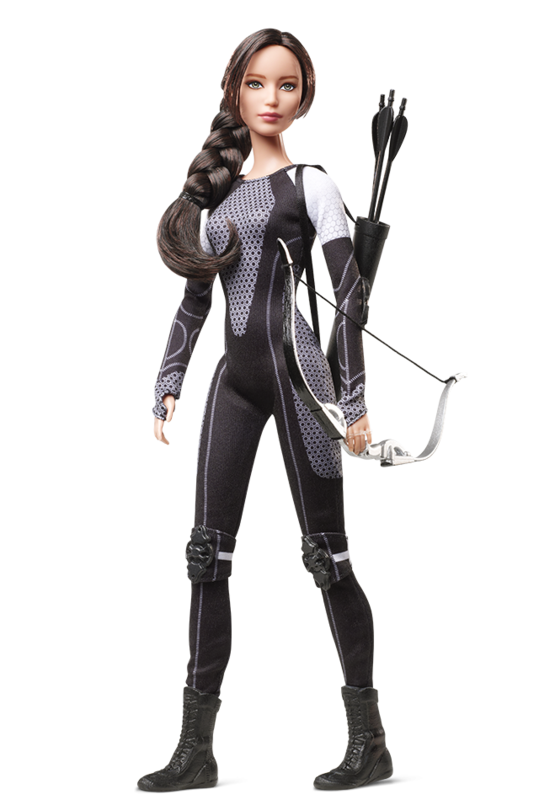 Personally, I'm still biased towards the original Katniss doll from the first movie. Maybe I will like this one more after I see Catching Fire. I was honestly expecting Effie to look a little more flamboyant, but I still think she's pretty, maybe one of her different colored hairstyles would have impressed me more. 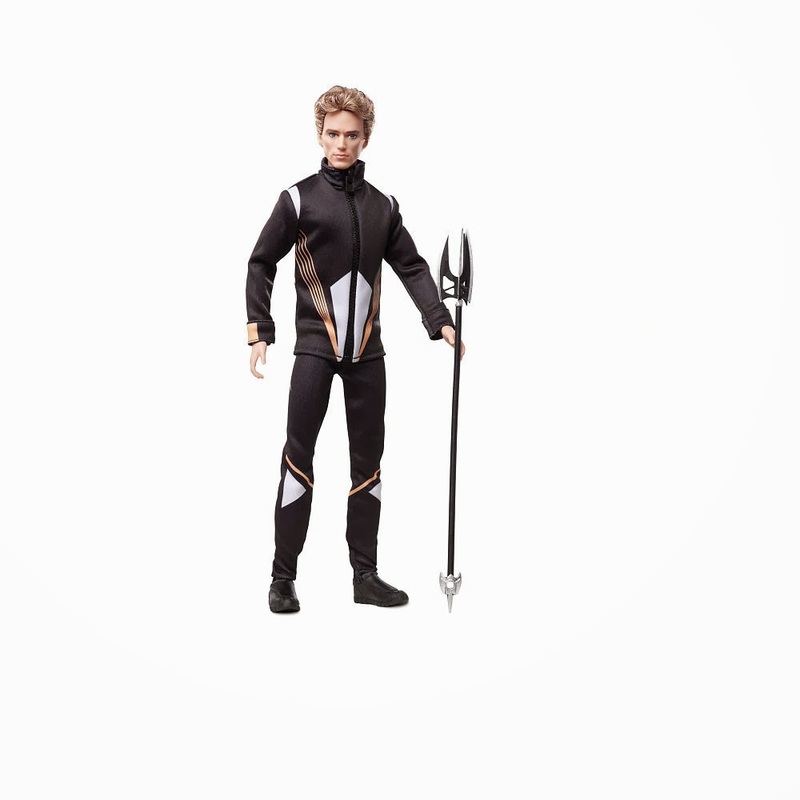 I WANT to love the Peeta doll, but I'm just not sure yet. I'm sure I will cave and buy him, haha! Disclosure: This is NOT a sponsored post, I just wanted to share the new dolls! This is such a fun picture book! There is so much to see and read on every page. It doesn't follow the typical picture book format. I think kids will really love reading this, since it is so interactive with all the things to see on each page. 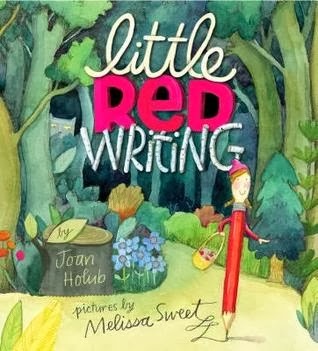 The story is a retelling of Red Riding Hood, from an all new perspective. Red herself is now a number 2 pencil going to school, and the wolf is an evil pencil sharpener that has captured Principal Granny! Red has a basket packed with words. She uses different words to help her along in her journey. The story and the illustrations in the book are non-stop fun, while being quite educational about words and sentence structure. And the best part of all, is the overall message of bravery! Bottom Line: This is such a fun book, it's one that you and the little ones in your life won't want to miss. A YA book based on a musical? Yes please! This book was on my to-read list before I even read the complete description. And believe me, it did not disappoint! I loved the book, and I honestly can't wait for a sequel. I grew so attached to the two main characters, their love interests, and the romantic fantasy world of Doon. 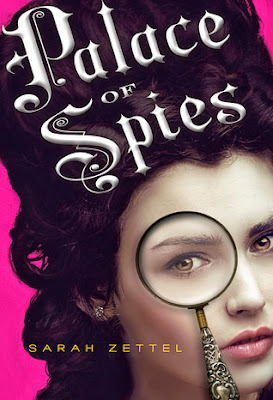 Usually, I'm iffy on time-travel books, but this one was just done so well! The book is so romantic, and I was biting my nails the entire time, trying not to get too attached to either of the couples. Because I wasn't sure it was going to end with a happily ever after! No spoilers, you will have to wait and see what happens to these two star-crossed couples. I loved that the book was told from both Veronica and MacKenna's points of view. Veronica definitely has a larger chunk of the story devoted to her, with MacKenna getting one chapter for every three of Veronica's. I may have been a bit biased towards MacKenna, she was the musical lover in the book after all! And I preferred her love story as well. But that didn't stop my from enjoying Veronica's parts of the story too! The the girls were so different, I loved seeing Doon from two different viewpoints. I also liked that the reader was able to see two totally different types of love interests, without the dreaded love triangle! 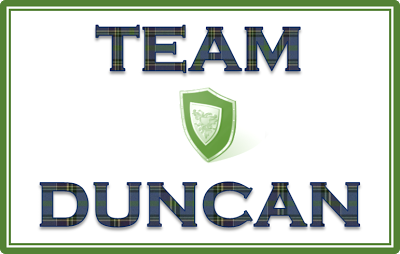 For me, I just fell in love with Duncan, he was head over heels in love with MacKenna and not afraid to show it! He was sweet, lovable, and always smiling, definitely my type of guy. Jamie was the brooding type for sure, and held back with his feelings for Veronica. Yes, it all was explained, and she generally called him out when he was acting like a jerk. It was kind of fun to see both kinds of romantic interests in the same book, something for everyone in a way. 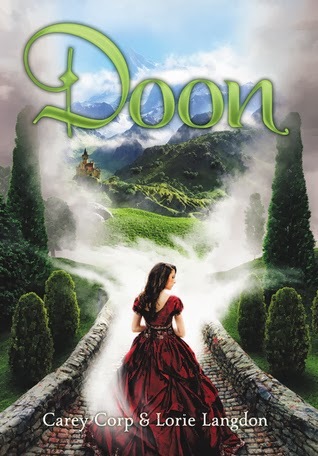 I was swept away by the story, the romance, and especially the fantasy world of Doon in the Scottish mist. Bottom Line: You don't have to know the story of the musical Brigadoon to enjoy this time travel romance. 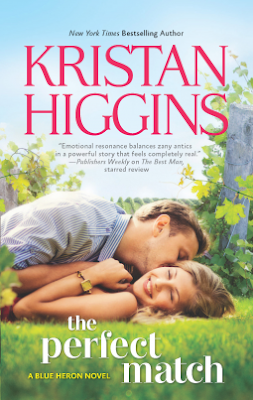 It was a great escape with two swoon-worthy romances! "The Passion of the Purple Plumeria"
Lauren Willig's books are always great, so even though this one wasn't my favorite of hers, it was still a good, entertaining read. I think my biggest hurdle with the book was William. Usually, Willig makes me fall head over heels for her love interests, even though her books aren't truly "romances." However, this time, the romantic lead just didn't work for me. I didn't see many redeeming characteristics in him. He was kind of an oaf, for lack of a better word. I'm all for strong heroines, but the hero has to keep up! William was just left in the dust by Gwen, she totally overshadowed him. Gwen, however was a fun character to read about. She was a very no-nonsense, tell it like it is type of character. She didn't take any flack from anyone, and I loved it! Gwen's strength, and the quick-paced mystery were what kept me reading. There was definitely a 'mystery' formula in this book, we jumped from suspect to suspect, and clue to clue, very quickly. However, this formula did keep me reading and I couldn't wait to find out what happened next. As usual with this series, the present day parts of the story were unnecessary to me. I just don't need the present day aspect in order to be interested in the historical part. I would rather just jump right into the historical world, without all the hopping back and forth from present to past. Bottom Line: While this isn't my favorite installment of the series, it's a good addition for readers who already love "The Pink Carnation" series. 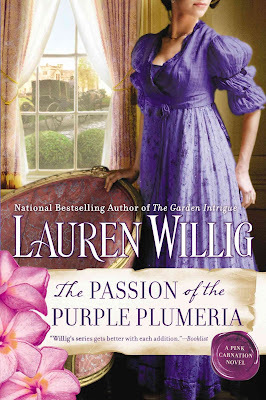 "The Garden Intrigue" (Pink Carnation #9) Includes a guest post by Lauren Willig! Review: "Geek Girls Don't Date Dukes"
"Geek Girls Don't Date Dukes"
Leah Ramsey has always loved historical romance novels and dressing in period costumes. So when she has a chance to time travel and experience the history for herself, she jumps at it—figuring it can't be too hard to catch the eye of a duke. 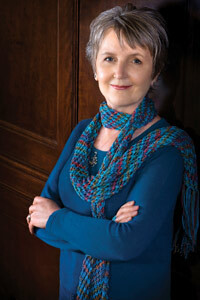 After all, it happens all the time in her novels. Avery Russell, valet and prize pugilist, reluctantly helps Leah gain a position in the Duke of Granville's household . . . as a maid. Domestic servitude wasn't exactly what she had in mind, but she's determined to win her happily ever after. Even if the hero isn't exactly who she's expecting. This is a fun, cute time-travel romance, it's a great rainy day read. Although it was a bit on the fluffy side, it was still a fun read, and I wanted to keep reading to find out what would happen. Time travel is a hard sell for me, because I would rather just be immersed in the fantasy of a historical world. But this book didn't overdo the silly factor, and there wasn't too much back and forth between the worlds. The best part of the book for me, was the fact that the hero was a servant, the Duke's valet. I really liked reading about the other side of historical life, not just the royals and aristocrats. I think after Downton Abbey, everyone has a hearty appetite for seeing how the 'downstairs' set lives. If it weren't for this aspect of the book, it might have blended into a bit of cliche and read like a lot of other time travel books. The ending was summed up a little too neatly, but there's nothing wrong with a happy ending! Bottom Line: Overall, this a fun, light read, with the added interest of reading about a working class hero instead of an aristocrat. 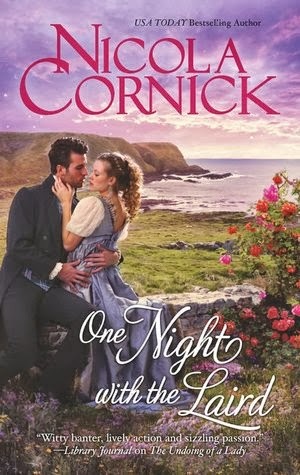 I love historical YA and this looks like such a different time period than what is usually available!